From now, the name Serena and Tennis will forever be remembered together just like Steffi Graf. Ladies’ Wimbledon Singles final: Serena Williams beats Angelique Kerber 7-5, 6-3. It’s a 22nd Grand Slam title to match Open Era record of Steffi Graf. 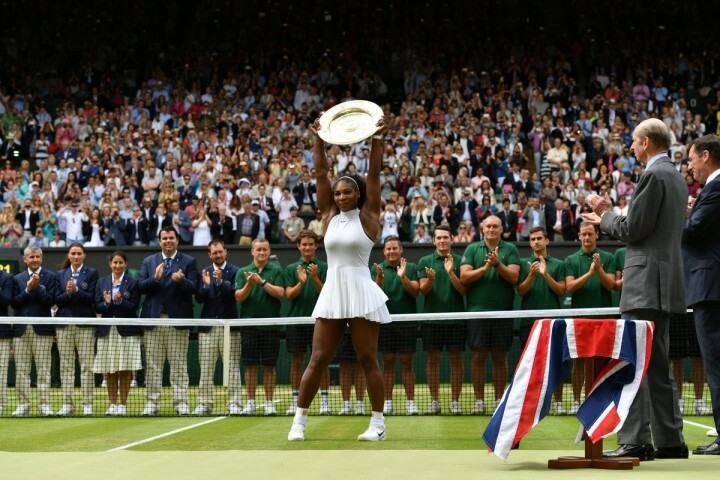 “Victory even sweeter knowing how hard I had to work for it”, Serena Williams said. A little twirl from Serena as she arrives on court to accept the famous Venus Rosewater Dish, a trophy which she is only too familiar with. A rousing reception and sustained applause from this Centre Court crowd. Serena was simply outstanding, more power-packed serving from a totally inspired Williams takes her to 40-0. And she gets the job done straight away from the net. It’s Grand Slam win number 22 to match the all-time Open Era record of Steffi Graf. She has raised her own high standards today and thoroughly deserves this triumph. it was an epic match and having the opportunity to watch it live game so much joy.